Bananas never ripe at my home. No weird thought. Before it is ripe, my folks at home finish it. So, whenever I want to try any banana based recipes, I buy and cook immediately. Few weeks ago, my dad got dozens of banana at a good price and he didn't notice the almost ripe bananas among them. The already ripe bananas were untouched for a day and I decided to use it one of my baking recipes. 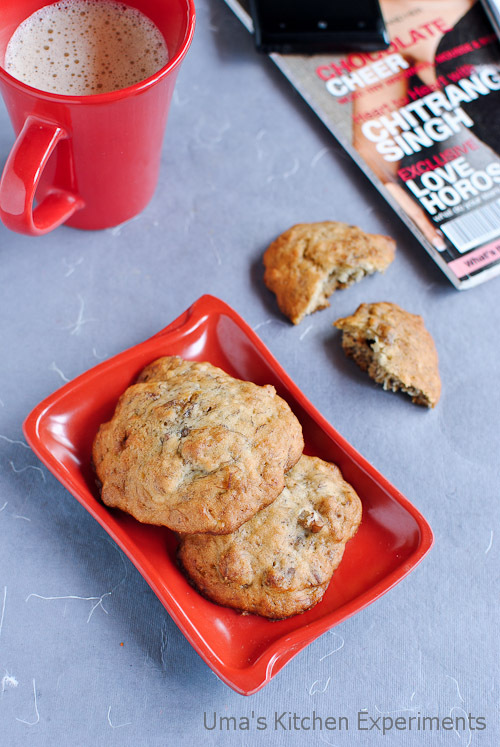 I looked into my 'to-do' recipes list and found these cookies recipe which works out well with the ripe bananas. The cookies were over in no time as they tasted fabulous. These cake-like textured cookies became an instant hit at home. 1) Preheat the oven to 176 C (350 F). Line the parchment paper/aluminium foil in a baking tray. Keep it aside. 2) In a mixing bowl, take butter and sugar. Beat it until it reaches the creamy consistency. 3) Add egg and continue beating until the mixture is light. 4) In another small bowl, take mashed banana. Add baking soda. Mix well and let it be for 2 minutes. This step is important since it helps the cookies to rise nicely. 5) After 2 minutes, add the mashed banana mixture to the butter mixture. Add vanilla extract. Slightly mix it. 6) Add the dry ingredients (all purpose flour, salt and ground nutmeg). Mix until they combine well. 7) Finally add roughly chopped walnuts and fold it into the batter. 8) Drop as dollops onto the baking tray with even intervals. Bake it in the preheated oven for 10-13 minutes or until the cookies turn golden brown. 9) Once done, take them using a spatula and cool it in a wire rack. 1) Always use ripe banana s as they provide perfect taste to this recipe. 2) You can also add pecans or chocolate chips instead of walnuts. Uuuuau! I love your blog! The photos are beautiful and all the recipes I've seen are wonderful! I love it! And to tell you this recipe ... I think a combination of delicious flavors and looks amazing. Exactly those cookies like mini cakes, spongy and delicious. 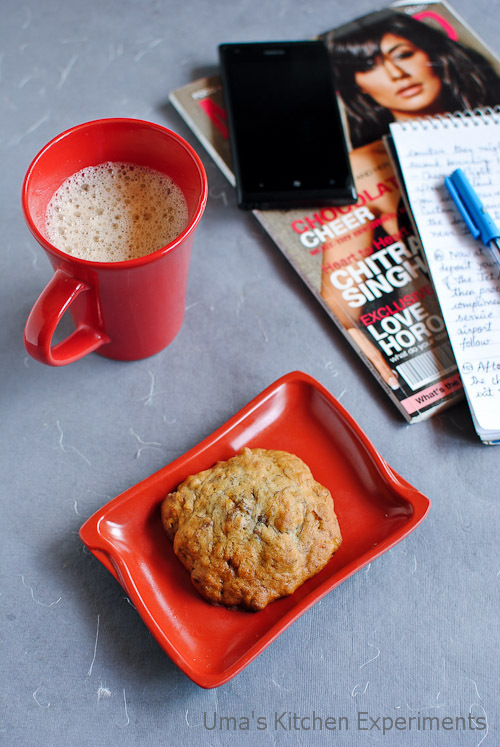 wow..this sounds interesting...looks so delicious n lovely cookies uma! Delicious and lovely looking cookies. Excellent preparation.Tahnks a lot for posting this step by step illustration. 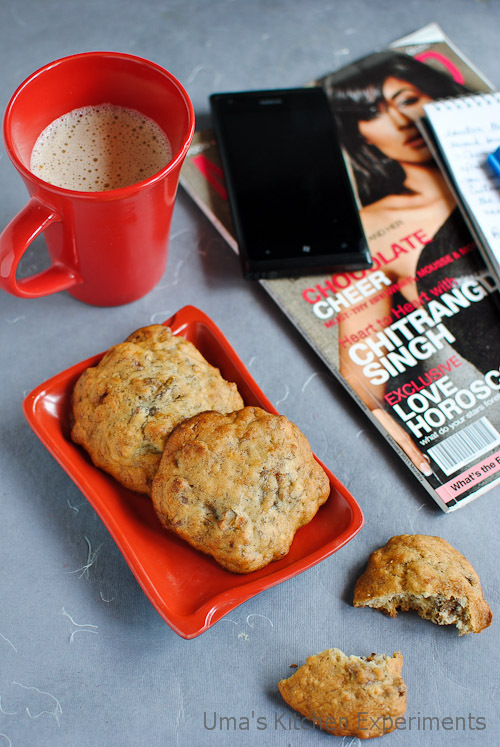 wish i could taste it now :) bookmarking it..
Those cookies look wonderful n tempting!! 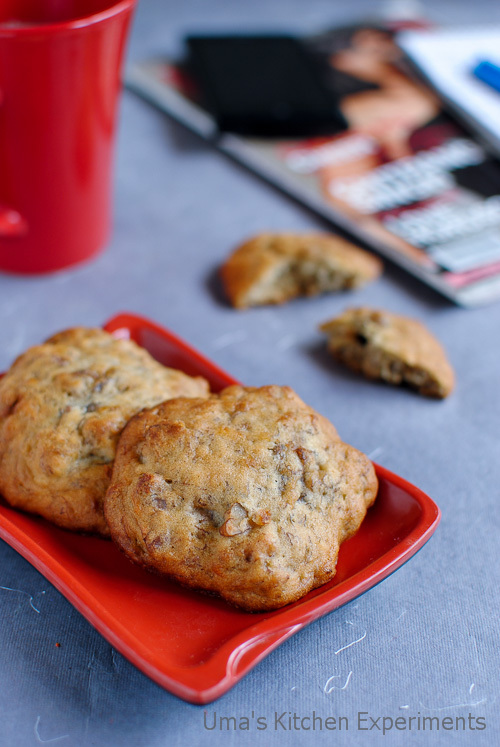 Delicious combo of walnuts and banana, cookies look yummy!